Work-related injuries, such as back injuries and carpal tunnel syndrome, are the most prevalent, most EXPENSIVE, and most preventable workplace injuries, accounting for more than 647,000 lost days of work annually (according to OSHA estimates). Such injuries, and many others, can be prevented in your facility by establishing an ergonomic design. 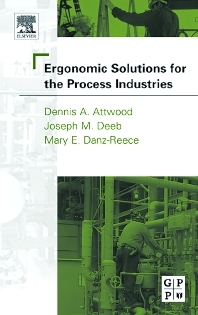 This book shows you how to apply simple Ergonomic tools and procedures in your plant. Challenging worldwide regulations are forcing some companies to spend thousands of dollars per affected employee in order to comply. This book shows you how to comply with these regulations at a fraction of the cost, in the most timely, efficient method possible. The Process Industries, such as petrochemical, paper, and pharmaceutical: Safety engineers and project personnel within the process organization (usually at larger companies), safety consultants (smaller companies), and students in engineering courses. Dennis Attwood has over 34 years of experience as a specialist in Human Factors Engineering and Ergonomics. He joined Risk, Reliability, Safety (RRS) Engineering USA in 2003 after 21 years with ExxonMobil Corporation as a Human Factors Specialist. Dennis has authored over 100 publications in the field, and holds a Bachelor's of Applied Science in Electrical Engineering and a Masters and Ph.D. in Industrial Engineering. Joseph Deeb, Ph.D., CPE, M.Erg.S. Joseph M. Deeb has over twenty years of experience in both University teaching and research and in applying Human Factors and Ergonomics to a wide range of industry businesses. Since joining ExxonMobil company,over 11years ago, Joe has provided Human Factors and Ergonomics global support for its operations. Joe has authored a number of external publications, both in refereed journals and conference proceedings, and internal reports. previously headed the Human Factors and Chemicals Toxicology Sections. the Ergonomics division of the Institute of Industrial Engineers.